Songs of roads, streets and cars from one of Australia's best songwriters. It’s A Long Drive is Don Morrison’s fifteenth (15!) release. He’s a songwriter, singer, guitarist, story teller and guitar maker and has shared the stage with many of the biggest names in Australian music, like Midnight Oil, Hunters and Collectors, Billy Thorpe, Joe Camilleri, Australian Crawl, Men At Work and a hundred more in more than thirty years in music game. He has worked with Bo Diddly, Joe Cocker, Rodriguez and even Billy Ray Cyrus, He was brave enough to stand next to Shakin' Stephens in a urinal and nearly killed by Willie Nelson in Austin, Texas. He’s done gigs from Bridgetown to Byron Bay, from Sydney to San Antonio, Perth to Penrith and released fifteen Albums and CDs of original songs under his own name and that of his many bands such as The Bodgies, The Ghetto Blasters, The Elmores, The Lonely Cosmonauts and now Don Morrison’s Raging Thirst. Don is also a luthier who makes the world renown Donmo Resonator guitars, mandolins and ukuleles. There’s now more that 500 of these hand made instruments being played on every continent in the world. (Except, maybe, Antarctica!). He’s written all about it in a rollicking autobiography “This Could Be Big"
Don might not be as young and pretty as he once was but he’s not done yet. Dubbed the Larrikin Troubadour Laureate of Adelaide, he is playing, singing and writing songs better than ever. The sense of humour that has seen him through the hardest times in a notoriously brutal industry still shines through in his songs and performances. He makes his own guitars, writes his own songs and sings them himself. 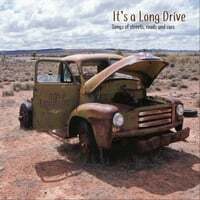 It’s A Long Drive is a collection of Don’s songs of roads, streets and cars from the last ten years or so. Some are new, some are old, some re-recorded and some remixed. This album is a cohesive musical reflection on driving through one of the biggest countries on the planet and comes with a booklet sharing the stories behind the songs. In Raging Thirst, Don is joined by his two sons, Eddie on bass and Jake on lead guitar and Hammond organ. Andy Przygonski joins in on drums and together they perform original, roots based, Australian songs with a cohesion and harmony unique to family bands.